Virgin Care is now one of the largest healthcare providers in the UK. 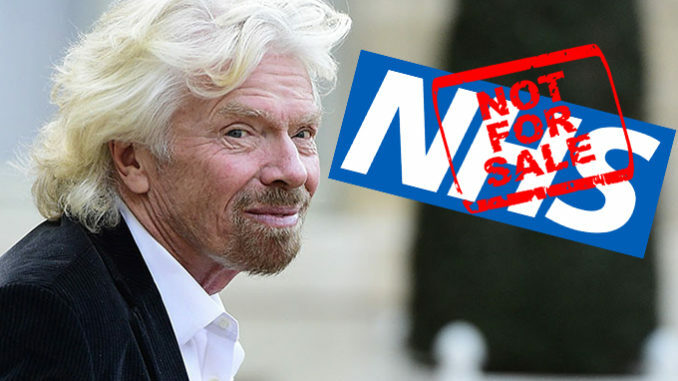 Over the last five years Richard Branson’s company have been awarded almost £2 billion worth of NHS contracts. They now hold at least 400 contracts across the public sector from immunisation to dementia care. 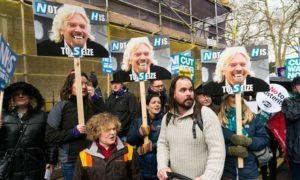 Keep Our NHS Public was amongst the first to report how Virgin received a £2 million pay-off in an out of court settlement after failing to secure a paediatric contract in Surrey. While the NHS remains dangerously short of funds, taxpayers’ money shouldn’t be wasted on these dangerous experiments in privatisation. 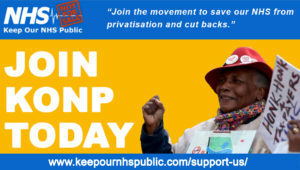 For many, the opposition to privatising the NHS is an ideological principle. The idea that there should be no place for profit in health provision is a strong and valid position. It is however not the only grounds on which we must be making the case against privatisation. The argument is not purely an ideological one, nor even a moral one, but a practical issue with serious and long-term implications that affect us all whatever side of the ideological fence we start from. If overall provision would remain largely unchanged, as those who would privatise the NHS so often promise us, what harm does it really do? The arguments for a more compassionate society, in which private business interests are made secondary to the good of society as a whole, are always worth making but we must also highlight that privatisation is always more expensive, inefficient and can be seriously harmful to patient care. Let’s unpick the arguments one by one. 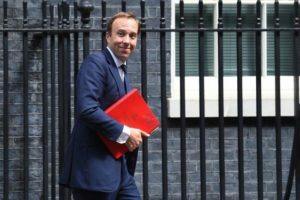 Organisations such as the Institute of Economic Affairs (IEA), with whom our new health secretary Matthew Hancock enjoys close links, say that privatisation of healthcare can be viewed as a positive. Those who follow this neo-liberal dogma argue that private healthcare is more not less efficient, that it relieves pressure on NHS services and that it allows patients to be seen sooner in more comfortable surroundings. Some say competition and choice encourage efficiency and that there is little harm in allowing it to continue as an alternative system for a range of health treatments. The reasons for retaining our NHS as a publicly owned and provided organisation, delivering universal access to comprehensive care, are far from solely ethical. Privatisation eventually erodes the very foundation of a free at the point of use health service, which means that in the longer term the poorer in society are at risk of serious illness or even death through lack of means. Many struggle to envisage an end to universal access to healthcare – a time in the future when lifesaving healthcare is withheld due to inability to pay. And of course, governments across the political divide have always maintained that providing essential healthcare for all will continue. They ridicule the prospect of a return to the ‘bad old days’ when the population suffered and died for want of medical attention. Yet the warning signs are already here; access has recently been denied to vulnerable groups in society – eg. refugees. In Manchester in June a Somali-born woman with advanced breast cancer was denied potentially life-saving treatment for six weeks because the government deemed her ineligible. And even those who have lived and worked here all their lives have in some cases been denied life-saving treatments. 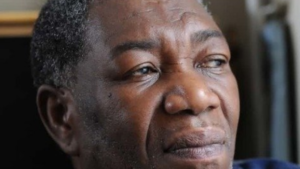 Notable amongst them has been ‘Albert Thompson’ who was refused treatment for cancer because he could not produce official documentation despite living in Britain since childhood. His treatment was only resumed following a petition and significant attention in the mainstream press. Access for the public to treatment in non-critical areas is also being eroded rapidly. On 30thJune, NHS England announced plans to end access to 17 procedures on the NHS. This assault on universal and comprehensive care is happening now – gradually but deliberately. Healthcare rationing boosts the private sector; it is now harder (or in some cases impossible) to access much-needed treatments on the NHS due to cutbacks. Increasingly GPs’ referrals are ‘vetted’ by a panel who must sanction them before granting patients access to much needed treatments. These new developments come under the heading of ‘cuts’, but they help foster the private health industry. Patients still need treatment, so cutbacks provide a perfect opportunity for the private sector to parade as a positive alternative to the NHS and gradually strengthen their market position. This ‘elective’ work also happens to be very profitable to carry out – the private sector is unquestionably poised to sweep up the areas not being offered. With surgical waiting lists at an all-time high, many wealthier patients are choosing to opt for private healthcare whilst the poorer must suffer in silence. The formation of a two-tier health system has arguably already occurred, but it must not become the norm. The more patients continue to access private medical care as an alternative, the more the issues of underfunding in the NHS will go largely unaddressed. Does the profit motive risk patient wellbeing? There was a lack of preparedness for patients whose condition could deteriorate. This drive towards profit at the expense of quality is not an isolated incident which must be taken seriously when weighing up the potential benefits of private over public provision. According to Professor Ley’s report (commissioned by the Centre for Health and the Public Interest), between 2013 – 2016 alone, private hospitals have cost the NHS around £250m by asking them to pick up the pieces for inferior care. Private companies do not deal in emergency care, managing critical illness is notoriously expensive and does not yield profit. Increasing privatisation would eventually downgrade emergency department (A&E) facilities as there would be less essential staff and services required to sustain emergency care. Skills, facilities and equipment are lost or gradually migrated across to the private sector with the NHS becoming increasingly dependent on them at significant cost. Private companies have already shown themselves to be ruthless towards the NHS when they have the monopoly and the NHS is reliant on them. 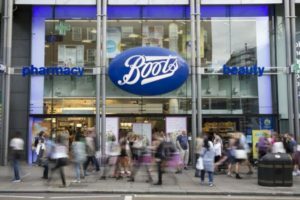 In May Boots charged the NHS £3,220 for one bottle of medicinal mouthwash costing £93. When companies realise the NHS has no other choice but to deal with them the financial implications for our NHS are dire. Organisations such as the IEA are fond of asserting that the NHS does not offer value for money to the UK taxpayer. This is simply not true – the NHS comes out top internationally. However, the private sector is universally more expensive, bringing with it major inefficiencies and failures, such as with the recent collapse of Carillion. One notable example of appalling inefficiency saw NHS England pay, Primecare £165,000 in 2016 for carrying out just one out-of-area GP home visit and 18 phone consultations in a 10-month period. Currently a proportion of taxpayer’s money is used to line the pockets of shareholders in private companies. When companies win NHS contracts (such as the huge contract Virgin obtained for paediatrics in Bath and North East Somerset), they are paid vast amounts to take over services. It is fundamentally wrong, but also incredibly wasteful to divert public funds to private profit. In addition,Virgin who are now a major private provider in the NHS do not pay any UK tax so any public financial investment is completely lost to the private sector. Sequestering funds offshore means the taxpayer loses out twice, once in paying the company, and again in losing any proceeds from tax. It is also often the public purse that pays in lawsuits for medical negligence in many cases where the NHS outsources patients to private hospitals due to a lack of capacity. In this way the private company profits but the NHS (and the taxpayer) pays twice. There is therefore no financial incentive for private providers to improve. Figures uncovered by Labour MP Roger Godsiff in 2016 found that the NHS lost around £52m in lawsuits bailing out private healthcare providers. 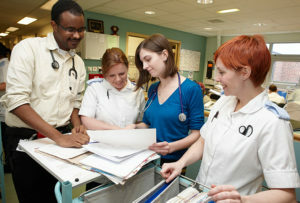 Our NHS employs some of the most coveted talent in the world. Clinicians could easily choose to work in the private sector where the pay is higher and the hours less; yet they believe in the system. The vocation of medicine for many goes hand-in-hand with the belief in equality of treatment. Private companies who publicise their staff as being somehow superior conveniently neglect to mention that the vast majority of medical staff in Britain are trained in the NHS. Privatisation not only negatively affects patient care but has serious and long-lasting implications for the 1.3 million staff employed in our NHS. Currently many employees are being transferred to private companies in different areas of the country, losing their NHS contracts and being migrated onto inferior terms and conditions with no say in the matter. 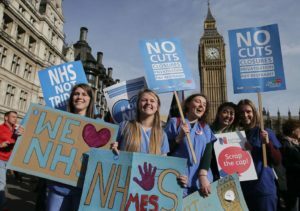 Transferring NHS staff onto public-private or wholly-owned subsidiary companies (SubCos) has prompted threatened or industrial action from Wigan, Leeds and Leicester to Bristol and Yeovil. So far the employees targeted have been largely ancillary but there are definite whispers that future plans extend to clinical contracts, raising the serious possibility that in future our NHS would cease to be an employer at all. The future looks uncertain. Currently as much as 10% of NHS provision is privatised and campaigners have done an excellent job in stemming the tide. The latest assault on a publicly owned and provided system in the form of the increasingly rapid introduction of Integrated Care Systems (ICSs), providing the opportunity for huge swathes of local provision to be signed over to private companies for long periods of time and governed under non-accountable contract law. Government plans now worryingly include a fire-sale of NHS land and properties totalling up to 5 million square metres in order to make money, and trusts have no choice but to comply. In March last year an independent report by Sir Robert Naylor commissioned for Jeremy Hunt looked at ways to raise NHS funds externally through selling parts of it off. The report concluded that £5 billion could be raised by selling properties and land. In May 2017, six regional private partnerships (PPPs) were set up to dispose of NHS land and property. Project Phoenix, (as it is distastefully named), involves private companies working with the NHS to sell land and buildings with profits split between the company and the government. Interestingly no details of the profit split have yet been announced. Under this scheme if trusts do not maximise the amount of land they sell off then they will not receive government funding, so have no choice. The land is ‘recommended’ to be used for affordable homes for NHS staff, but there is nothing currently stopping much of it being sold off as luxury housing. This is a way to asset strip our NHS by selling the land from under us. Selling off our facilities as a way to plug a critical financial gap created by years of government underfunding is a disgrace. In a world where public systems are wilfully neglected, profit is revered above all else and taxpayers unwittingly make up for the failings of private companies, our NHS would be treated like any other business; answerable not to the public, but to the rich with stakes in companies profiteering from illness. The Health & Social Care Act 2012 opened the door wide to those who care little about who can access treatment, or the quality of provision offered. When those who control health provision care less about patients and more about their bottom line, and when staff are employed by a myriad of individual companies, there is the potential for ‘NHS’ to become merely a kite mark for private companies to hide behind and operate under. The future of the NHS may be uncertain, but what is certain is that Keep Our NHS Public, the Health Campaigns Together alliance and our allies will continue doing everything in our power to expose the lies, answer the important questions and influence those who can change our political landscape. None must rest on their laurels. Privatisation is not a harmless alternative but a vehicle that, if left unchecked, could easily spell the end of equal access to universal, comprehensive, quality healthcare as we know it.